Printable wine bottle labels are great gifts, party favors, and decorations. Use blank wine bottle labels to celebrate an engagement, wedding, graduation, birthday, and more. The rectangular shape is great for a variety of wine bottle shapes and sizes. This material is not water resistant. Make your own wine bottle labels with dates, photos, names, and other exciting information. 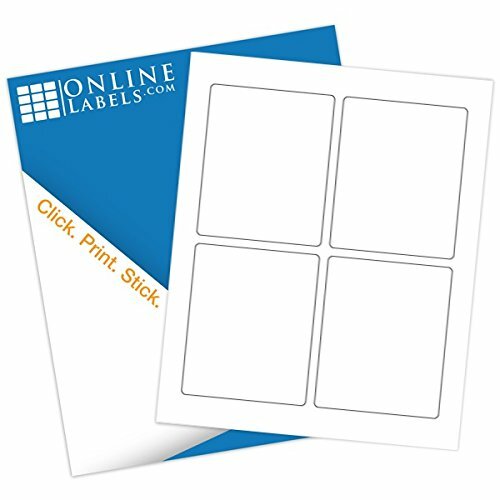 You can design your custom stickers using Maestro Label Designer, an exclusive design program for Online Labels customers. It's included in every order with your unique code listed on your order's packing list. When you're ready to print, our white wine bottle labels work in both laser and inkjet printers like HP, Canon, Brother, Epson, Dell, and more. Every order of our blank labels comes packaged in a hard plastic storage clamshell to keep your sheets protected during shipping and between uses. If you have any questions about this product by OnlineLabels, contact us by completing and submitting the form below. If you are looking for a specif part number, please include it with your message. Vooseyhome The Rose Wax Seal Stamp with Rosewood Handle - Ideal for Decorating Gift Packing, Envelopes, Parcels, Parties, Weddings, Invitations, Cards, Signature and Everything You Like!